This conservatively styled 45 gal (170 L) receptacle embraces contemporary lines with a traditional look. Side-door litter receptacles are a marvel of detail and structural integrity. The side door hinges have stainless-steel hinge pins and oil-impregnated bronze bushings. Also available as models NSDC-24: 24 gal (90 L) and NSDC-36: 36 gal (136 L) capacities. Wide mouth convex lid. Heavy steel latch. 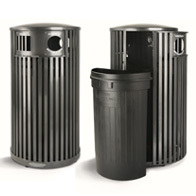 Other standard features include a formed lid attached to the frame, a high-density plastic liner, and rubber-tipped leveling feet on the base. 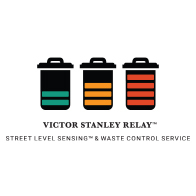 Victor Stanley Relay™ Sensor and Service available with dome or rain bonnet lids. Keyed locking mechanism (US Patent 6,339,944 B1). Dome lid (ashtrays available). Rain bonnet lid (ashtrays available). Recycle lids. Half-Moon liners. Custom decals and plaques. 209 queries in 0.465 seconds.